When pedestrians and cyclists are involved in accidents involving motor vehicles, the results can be devastating. According to statistics published by the National Highway Traffic Safety Administration (NHSTA), 677 cyclists were killed and another 48,000 were injured in the United States in 2011 alone. When it comes to pedestrians, the numbers are even higher. NHSTA data indicates that in 2010, 4,280 pedestrians were involved in fatal accidents and another 70,000 were injured. The injuries that cyclists and pedestrians can sustain in accidents involving motor vehicles can be very severe, and may result in past and future medical expenses, past and future lost wages, past and future pain and suffering, property damage, and loss of quality of life, among others. Fortunately for victims of such accidents, the law allows people who are injured due to the negligence of others to recover through a personal injury lawsuit. The lawyers of Greenberg & Strelitz, P.A. are Florida personal injury attorneys who are dedicated to helping people injured in bicycle and pedestrian accidents recover for their injuries. These are just a few of the ways in which a driver could negligently cause a bicycle or pedestrian accident. In order to determine whether you have a claim, you should consult with an experienced personal injury attorney at Greenberg & Strelitz, P.A. as soon as possible. Waiting to file a claim may present the risk of loss of evidence or the fading of witnesses’ memories, and may prevent you from filing a claim altogether. You should contact Greenberg & Strelitz, P.A. as promptly as possible after such an accident. If you or a loved one has been involved in a bicycle or pedestrian accident, you may be entitled to substantial compensation. Any damages you sustained, including medical expenses, lost work, pain and suffering, or property damage, may be compensable through a Florida personal injury lawsuit. The attorneys of Greenberg & Strelitz, P.A. 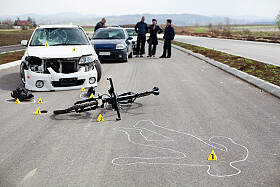 are dedicated to helping people injured in bicycle and pedestrian accidents recover for their injuries. After an accident, it is important that you undergo a complete medical evaluation so any injuries that you may have sustained are properly diagnosed and documented. In order to schedule a free consultation with one of our attorneys, please contact us today by calling (561) 361-9400, or by filling out our online contact form available here. Se habla Español.